As shown by Hjort (1914), the early stages of the life cycles are the crucial ones for Atlanto-Scandian herring. Abiotic factors and food supply play an important, maybe decisive, role during this period. The spawning season begins earlier in warm years than in cold years. According to Dr. Axel Boeck (referenced in Devoid, 1963), one of the symptoms of decline in the Norwegian herring fishery toward the end of the previous century was that herring arrived later each year for spawning at the Norwegian coast. Also, in warm years the development of phytoplankton and zooplankton starts earlier, the process is more intensive and its duration is shorter. The herring already begin to feed in spring; they attain maximum fattiness in June July. On the other hand, when the water temperature is low, plankton development is slower and takes more time. The feeding season lasts longer and the herring become fattiest in August-September. When the advection of warm Atlantic waters by the Norwegian Current increases, herring larvae tend to be distributed in the northern and northeastern parts of the Norwegian Sea and in the Barents Sea. In colder years, when the inflow of warm waters from the south is relatively weak, the larvae concentrate in coastal waters along southern and central Norway (Seliverstov & Seliverstova, 1991). Fluctuations in the intensity of the Norwegian Current determine not only the distribution pattern of larvae and juveniles but also influence growth rate, maturation age and, hence, variations in recruitment to the spawning stock. Normal and abundant year classes, appearing as a rule in warm years, recruit to the spawning stock at the age of four to five years. About 70 percent of individuals in the strongest year classes reach the mature stage at five to six years and the remaining 30 percent at seven to eight years. The weak year classes, most often associated with cold years, enter the spawning stock at an earlier age - more than 60 percent of individuals at three to four years, and the maturing process is completed by the age of five years. Water temperature is also of great importance during the first wintering. There is evidence that the relationship between the appearance of strong year classes and environmental conditions is likely to be more pronounced for annual temperature and ice than for temperature during the spawning season (Gershanovich, 1986). Bogdanov et al. (1969, 1976) established a good correlation between variations of relative abundance of herring stocks and water temperature in the 0-200 m layer at Kola Section; this was considered a good indicator of the temperature regime in the whole Northeast Atlantic (Izhevsky, 1961). Changes in water temperature in the Northeast Atlantic are determined to a great extent by atmospheric circulation patterns. In their study of winter and spring circulation, Rodionov and Krovnin (1991) showed that strong year classes appeared when the deep Icelandic low became coupled with the developed Azore high. In this case, the distribution pattern of sea level atmospheric pressure anomalies indicates increased heat transport to the Northeast Atlantic and the Norwegian Sea. On the other hand, the principal feature of atmospheric circulation in the years when poor year classes occur is the formation of the positive anomaly cell over Greenland and, as a result, an increased frequency of northerly winds over the region. Linkages between catches of Atlanto-Scandian herring and secular variations in ice conditions were studied by Yudanov (1964) and by Beverton and Lee (1965). As shown in Fig. 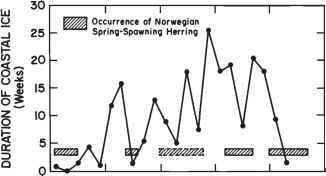 11.7, periods of high catches of Norwegian spring-spawning herring start when there is a decrease in the length of time of the ice cover, and all of them end as the length of time of the ice cover increases. It was also shown that rich year classes of herring occurred less frequently in cold periods than in warm periods. In addition, Bogdanov et al. (1969) noted that recruitment of the spawning stock fluctuated substantially from year to year in the cold periods, whereas in the warm periods its interannual fluctuations were much reduced. most pronounced after the 1920s. Air temperature both in the Northeast Atlantic and averaged over the Northern Hemisphere reached its maximum value by the late 1930s, after which a cooling started, however, the ocean temperature continued to remain at a high level into the 1950s (Fig. 11.8). The subsequent climatic cooling was most marked in the 1960s. The sharp decline of ocean temperatures occurred in the Norwegian and Greenland Seas. At Jan Mayen six of the seven severest winters since 1922 occurred between 1965 and 1970 (Rodewald, 1972). As mentioned earlier, the formation of a positive anomaly cell of atmospheric pressure over Greenland is important for the cold climatic regime in the Northeast Atlantic region. For the period 1956-65 mean winter atmospheric pressure over Greenland was 7 mb higher than during the period 1900-39; by the end of the 1960s it had increased by another 5 mb. Frequent outbreaks of cold air east of Greenland promoted the increase in ice cover in this region. Expansion of the ice cover along the eastern coast of Iceland by 1968 was at its southernmost limit in this century (Malmberg, 1984). Fig. 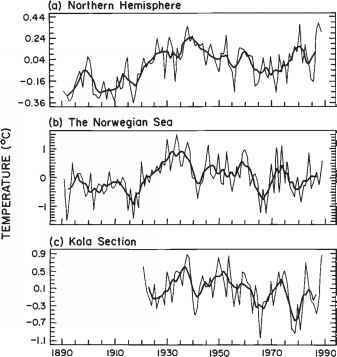 11.8 Annual surface air temperature for (a) the Northern Hemisphere (2.587.5° N), (b) for the Norwegian Sea, and (c) annual water temperature integrated over the 0-200 m layer on the Kola Section (70°30'N, 33°30'E - 72°30'N, 33°30'E). Departures from the 1951-80 reference period. Heavy lines represent 5-year running means. Descriptions of surface air temperature and sea temperature data files are given in Gruza et al. (1990) and Bochkov (1982), respectively. 1980b). One could say that climatic changes, coupled with heavy exploitation, were the main reasons for the collapse of herring stocks in the late 1960s. It seems that climatic variability has increased in recent decades. Environmental conditions may change abruptly both from year to year and from one set of years to another. For instance, since 1971, the character of atmospheric circulation of the North Atlantic changed radically (Dickson et al., 1975). The increase of atmospheric pressure over Norway, Greenland, and the Irminger Sea, which had been observed for a long period of time, ceased suddenly. The positive pressure anomaly cell over Greenland almost vanished. The mean atmospheric pressure in that area dropped by 9.5 mb between the periods 1966-70 and 1971-74. A reduction of northern outbreaks over the Norwegian Sea resulted in a warming of these waters. It is important to note that the positive water temperature anomaly was at a maximum in higher latitudes and decreased toward the south. In the Faroe-Shetland Channel, during 1971-75, negative anomalies predominated (Sobchenko, 1979). As a whole, the climatic regime in that period may be considered to have been favorable for the Atlanto-Scandian herring but, because of the state of depletion of the stock, strong year classes did not appear. In the second half of the 1970s there was a reversal in regional climate conditions once again. 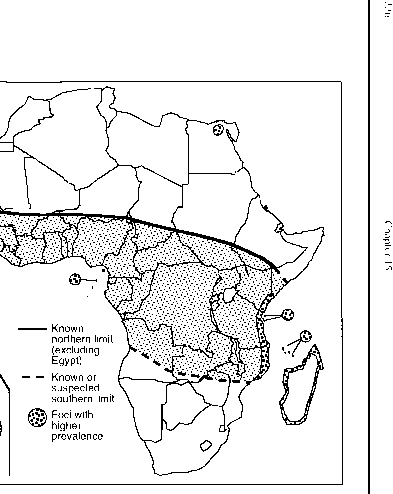 According to Rodewald (1978), during the winter of 1977-78 a shift from the regime of strong zonal circulation over the North Atlantic to the regime of weakened circulation occurred. The frequent northern outbreaks over the Norwegian and Barents Seas resulted in a cold climatic regime in that area, which generally resembled the climate of the 1960s. However, Bochkov et al. (1987) pointed out that the main reason for water temperature decrease was the weak heat advection by the North Atlantic, and the Norwegian and Nordcap Currents. From 1977 to 1981, the area in the Barents Sea occupied by warm Atlantic waters (with temperatures of more than 2°C) contracted by a factor of 4, compared to the 1972-76 conditions. The subsequent warming, which peaked in 1983, undoubtedly promoted the appearance of the strong 1983 year class. Preliminary results show that, because of the favorable thermal conditions in 1989, the recruitment of that year class would be relatively high.